Flying in the face of what seems to have become common thought, especially in communities similar to the one on this site, Nintendo believes their Nintendo 3DS has shown that there is room in the market for a dedicated gaming device. Contemporaries think smartphones are pushing handheld gaming systems away from consumers, but the graph above and Satoru Iwata’s quote below speak to the contrary. 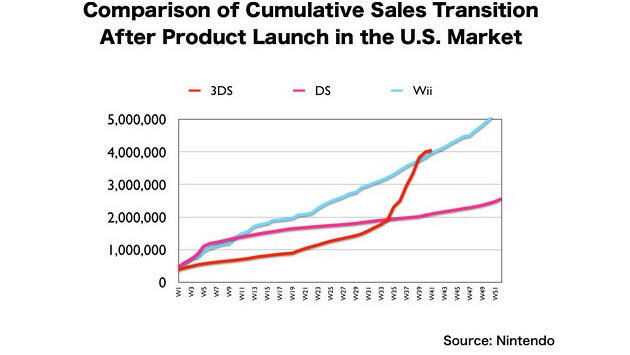 The Nintendo 3DS, following its price cut, has been selling exceptionally well for Nintendo. It’s looking less like a doomed device and more like Nintendo’s new stance in the portable field for the next few years. Nintendo still took a large fiscal loss on the year. The Wii and the Nintendo 3DS both showed a tremendous amount of sales growth around the holiday, but their early year performance was too much to overcome. However, the pace and trajectory of the Nintendo 3DS has demonstrated there is plenty of room for gaming dedicated portable hardware on the market.